Senate President Troy Jackson finds himself in a peculiar situation where the impact of one bill he is supporting would punish constituents for complying with another bill he is supporting. Photo courtesy Maine Legislature website. 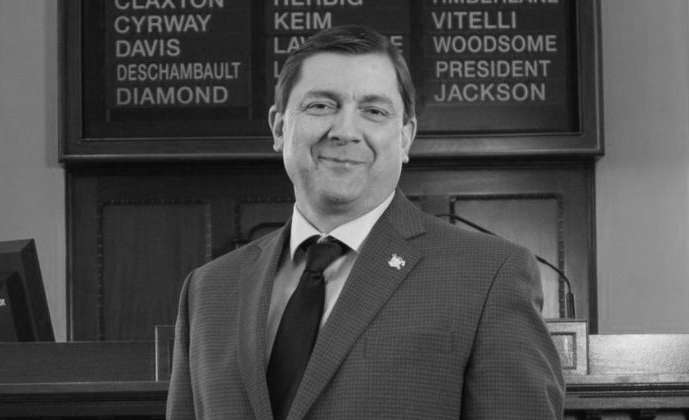 AUGUSTA – Maine small businesses will truly be stuck between a proverbial rock and a hard place if two of the bills Senate President Troy Jackson is supporting both become law. It’s an interesting conundrum, and one that lawmakers working to make carefully calibrated reforms typically avoid. One of the proposals Senate President Jackson is cosponsoring would mandate Maine small businesses provide paid sick leave to employees. Another proposal Sen. President Jackson is cosponsoring would essentially punish small businesses for providing that same paid leave because it requires small businesses to maintain rigid scheduling and provide schedules to workers two weeks in advance or face financial penalties. The sick leave proposal has seen a counter-offer from Legislative Republicans indicating they are interested in working with Democrats on a deal that creates a workable policy. The second bill, however, would require Maine small businesses with 5 or more employees to provide workers with a schedule two weeks in advance, or face a fine of $50 per day for non-compliance plus, potentially face additional civil action by the Maine Attorney General. These small businesses would also be required to maintain records of their schedules for a minimum of 3 years. If both these proposals were to go into effect, Maine small business owners would then be placed in a position of being punished for schedule changes that they would be required by law to make as a result of the paid sick leave law. The two bills share a similar path in their journey to become law, being considered by the Legislature’s Committee on Labor and Housing. The paid leave proposal (L.D. 369) has already had a public hearing and two work sessions, with committee members remaining divided so far. The public hearing for the paid leave proposal drew testimony from nearly 80 individuals and groups, with some opponents of the bill including: The Maine School Boards Association; National Federation of Independent Businesses; The Maine Grocers and Food Producers Association; Hospitality Maine; the Maine Tourism Association plus a host of individual small business owners. Among those testifying in support of the bill were liberal non-profit groups such as the Maine Center for Economic Policy; Equality Maine the Maine People’s Alliance and several labor unions. Others, such as the Maine Hospital Association, testified neither for nor against, but recommended changes to the proposed bill. Numerous pieces of testimony on the paid leave proposal warned that the Maine Legislature risks going too far with a wave of regulatory and labor proposals being considered. The other bill (L.D. 1345), which would require two weeks written notice for the schedules of workers, has been referred to the Labor and Housing Committee for a hearing today, April 10th. The two-week notice bill is likely to face stiff opposition from small businesses and numerous Maine industries, especially those whose business models rely on picking up work on short notice, in seasonal environments or that are subject to Maine’s weather, among other things. The two proposals are two of the dozens of bills that impact labor and small business that are being considered by the Maine Legislature this session.